If you’re looking for an extremely versatile tabletop folder, you’re looking for the 407A Automatic Programmable model from MBM. This model has six standard folds pre-programmed, but allows for 27 custom folds to be stored in its memory, ready to recall at any time. Other than its robust memory, the MBM 407A paper folder is very similar to the 307A. 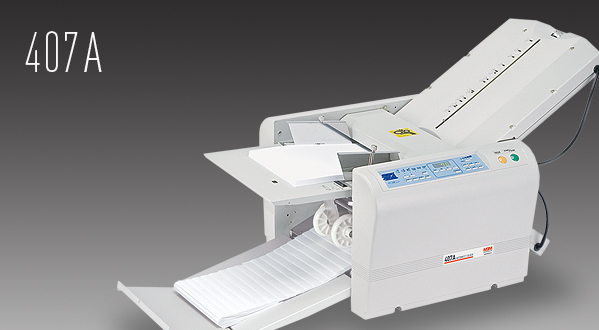 It accepts 450 sheets at a time at up to 11″ x 17″ in size. It folds more than 11,000 per hour, and it features an automatic feed table ensures optimum feed pressure, so there are very few jams or adjustments for paper stock. The self-setting exit rollers ensure smooth ejection of folded paper and keep everything in neat sequential order. Check out the 407A Automatic Programmable Tabletop Folder for easy maintenance, durable all-metal construction, and the availability of an optional perforator or scorer. The 407A Automatic Programmable Tabletop Folder is $4,139 at Lloyd’s. We’ll throw in free shipping and a gift with your purchase. For more information on the MBM 407A Automatic Programmable Tabletop Folder or to place an order, please visit the Lloyd’s website.